We know you put time and love into each quilt top, and we want to help you complete it with beautiful quilting. 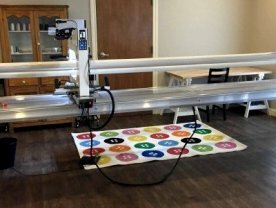 We use an APQS Millennium long arm machine and have countless patterns to choose from. If you cannot find what you are wanting, let us know and we will look for it! We charge $0.015 per square inch. Measure the length and width of your quilt then multiply those two numbers together. When you have that number, multiply it by 0.015 and you will have your total. 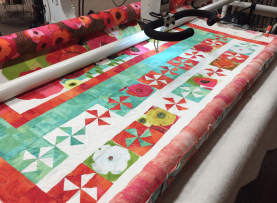 Quilter’s Hideaway can be your one stop shop to finishing your quilt. We have different types of batting as well as many options of backing. Look below for quilts we have completed and the different patterns we have used. I love watching how quilting can dramatically alter a quilt for the better. It brings in a new layer and adds depth to the quilt. Do you have a quilt ready to be quilted? Bring it in today and let’s see what we can come up with! *Quilter's Hideaway does have a minimum charge of $25.